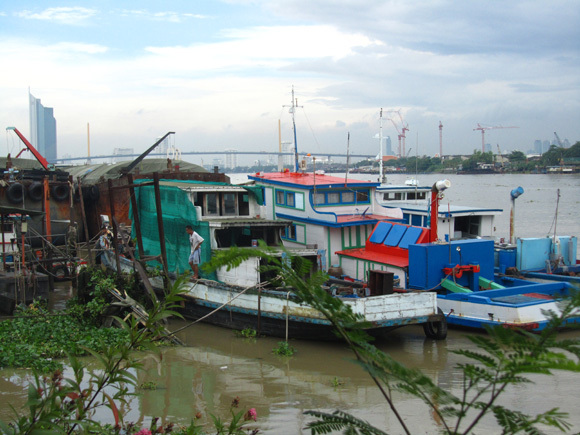 Phra Pradaeng District is known as Bangkok's green lung. 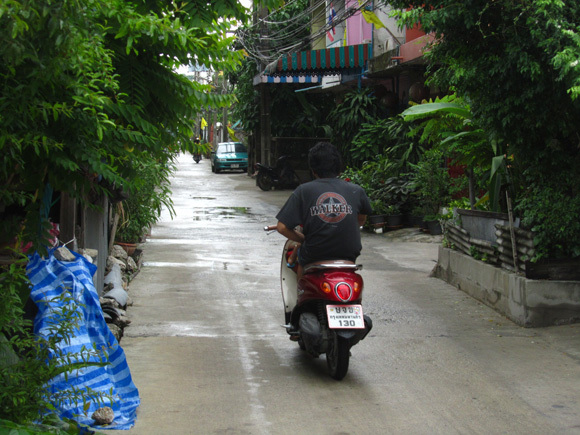 On the edge of Bangkok's cloud of smog and wall of skyrise buildings is a green refuge, a suburb that has been set aside as a quiet residential neighborhood. Canals haven't been filled in to make way for roads and plots of trees and overgrown shrubs still exist in full bloom next to businesses and markets. Everything is just more relaxed in Phra Pradaeng. It's a place to remove yourself from the stress of Bangkok, while remaining within the city. Though just moments from the the chaotic side of hustle and bustle, Phra Pradaeng is still an area where it's possible to enjoy a peaceful bowl of noodles, take a calm walk next to a canal, or just breath fresh air. People still ride their bicycles in harmony, not having to worry about getting hit by roaring streams of traffic or inhaling lungs full of putrid truck fumes. It's the one place in Bangkok where man powered bicycle rickshaw taxis are one of the most popular ways to get around, not obnoxious tuk tuks. There's a real feeling of community, a sense that everyone knows each other and people genuinely take the time to chit chat, be friendly and help each other out. 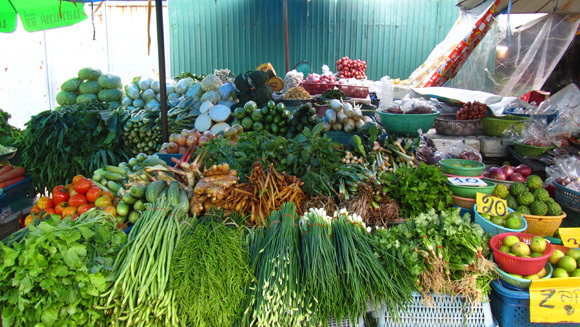 Market vendors smile, beg you to purchase or sample their products, and are honestly excited to see you visit! Even the central Phra Pradaeng market is calm in comparison to most market scenes in Bangkok. The fruit and vegetables look to be just slightly fresher than elsewhere, and because time seems to move slower, people arrange their vegetables in an artistic fashion. 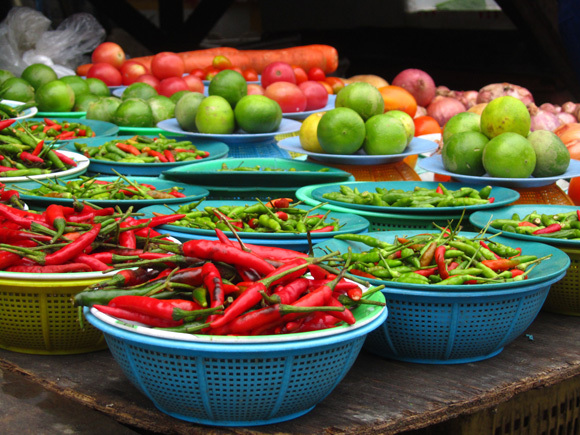 Seeing the brightly colored variety of fresh produce and the selection of Thai herbs and spices offers a glimpse into the reason Thai food is so delicious. I couldn't help but marvel at the museum worthy market displays of Thai chilies, limes, onions, and tomatoes. There's not the endless supply of street food like in central Bangkok, but there are still many eating options to choose from and a selection of restaurants that are surrounded by lush scenery overlooking the Chao Praya river. The last time I visited Phra Pradaeng, I stumbled into a restaurant that I found irresistible to pass. 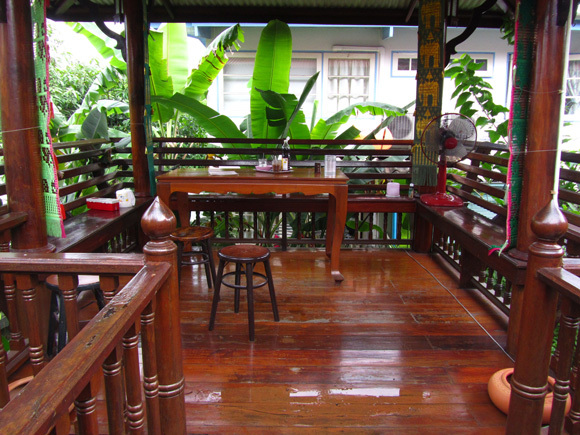 After being lured in by the attractive smell of pork balls and steamed noodles, I was directed to a tranquil loft on the second floor, surrounded by banana and mango trees. The restaurant was famous for a certain bowl of noodles known as Kuay Teow Tom Yum Sukhothai (Sukhothai style noodles in spicy Thai soup). 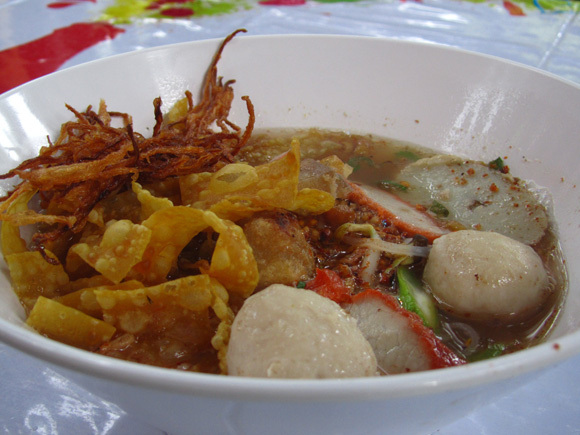 The dish started out with a choice of noodles that were flash boiled in scorching water and tossed into the bowl. A variety of pork balls, fish cake, barbecued pork, string beans, and toasted garlic were all added to the noodles before the spicy soup was ladled on top. Lastly a handful of garnishing herbs, a few deep fried chips, and a little piece of shredded deep fried papaya completed the masterful mixture. As I slurped down the perfect bowl of noodles in the most ideal of environments, I couldn't have been much happier or more relaxed. If you are looking to find a breath of fresh air in Bangkok, Phra Pradaeng makes the perfect day trip getaway. Bicycles are available for rent in the area if you are interested, but sometimes it's also just nice to take a walk, forget about the giant city, and enjoy one of most pleasant districts in Bangkok! It is hard to believe for Bangkok, but I’m glad it still exists! Here’s the funny thing, when I arrived in Bangkok after two months in India, I thought it was the cleanest city I’d seen in Asia, including the air. I didn’t get how others complained about the pollution, because there’s no comparison with India. how to get there with public transpotation?